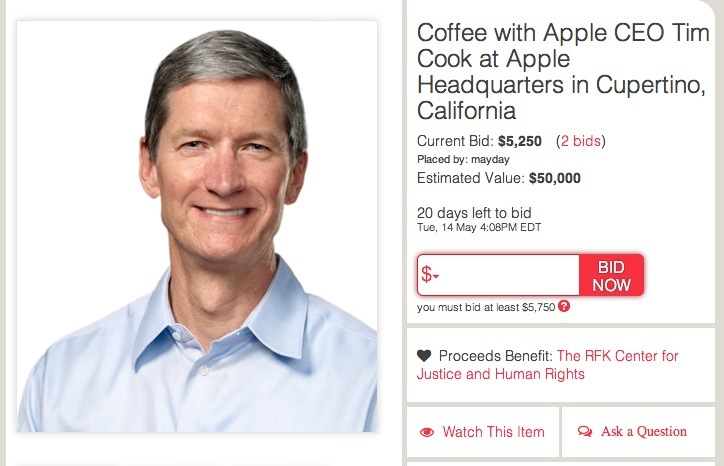 According to a Charitybuzz release today, Apple CEO Tim Cook is holding a charity auction (the listing says ‘donated by Tim Cook’) for coffee and a chat with him at the company’s headquarters. The auction benefits the RFK Center for Justice and Human Rights and just went live this morning, we were tipped to it by writer Kyle Gray and tech writer Andy Ihnatko. We’ve contacted Charitybuzz about the listing and this is indeed a legitimate auction. It’s a listing that covers a visit for two people after a security screening. The bidding is currently at $5,200, but the estimated value is marked at $50,000. This is the first time that Cook has ever auctioned off one-on-one rights for charity. Charitybuzz says that the coffee meeting is expected to be anywhere from 30 minutes to one hour long. Cook isn’t alone in offering one-on-one time either, the RFK auction features listings for meetings with Francis Ford Coppola, Robert DeNiro, Alex Trebek, Carrie Underwood, Peyton Manning, William Shatner, David Letterman and others.